In the age of so called “post-truth world”, when some scientists speculate that the Universe might be a hologram, when we discuss our intra-actions from the molecular to global levels (from Karen Barad to McKenzie Wark), when the world’s structure is described as the so called “Stack (Benjamin Bratton, “The Stack”, MIT, 2016), an accidental megastructure, that is both a computational apparatus and a new governing architecture”, and the Big Data is called an information bomb (James Bridley, “Cloud Thinking”), when our lives are already being changed by the global warming (even if some still deny it), when concepts like hyper-objects (Timothy Morton) are traversing the universe as we know it and as we don’t; what are the reasons that we are still fixated on the White Cube as a framing device? Drawing from numerous ideas by historical avant-garde artists to survey contemporary notion of ‘exhibition in a cloud,’ the lecture will discuss recent trends in exhibition making. Valentinas Klimašauskas (b. Kaunas, Lithuania, works from Munster, Germany) is a curator and writer investigating how the new multitudes are being (self) quantified in the new geopolitics of planetary-scale computation in post-Westphalian modes of political geography. Recent curated exhibitions include “Portals or location scouting in Kaunas” presented by Spike Art Quarterly; “A Hat Trick or a Theory of the Plankton,” Podium, Oslo, 2016; “Time flies like an arrow, fruit flies like a banana,” Tinos Cultural Foundation, GR, 2015. Recent writings and readings include “Everybody Reads!”, the nights of horizontal readings, and “How To Clone A Mammoth (In Three Voices And With A Fisherman’s Exaggeration)”, which is a reading afternoon on the poetics of de-extinction in the economy of clicks. 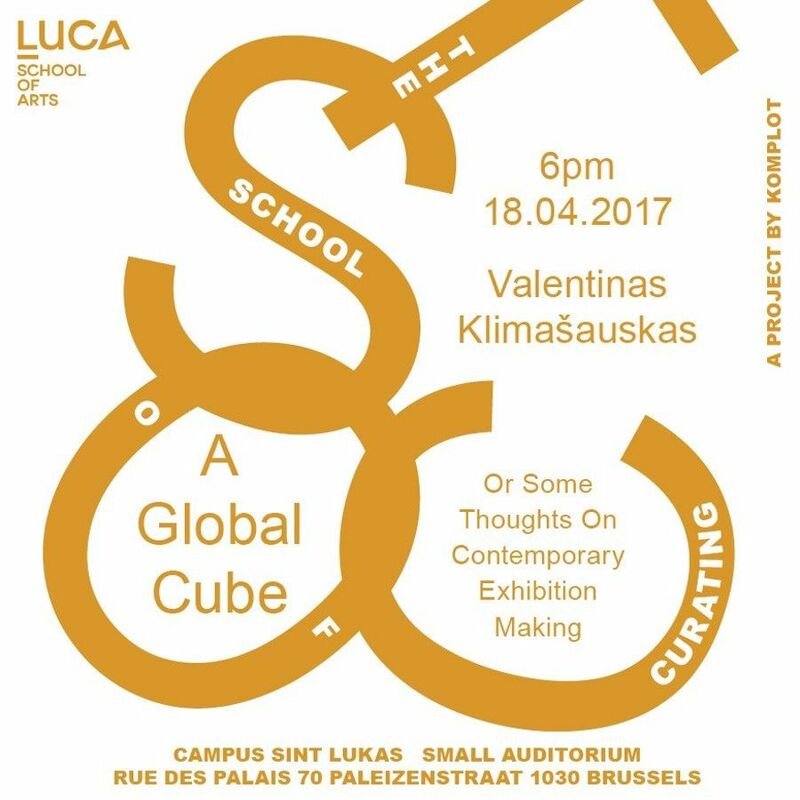 Komplot and the Visual Arts Program of Saint Lukas, Brussels.